Although it has precursors dating back as early as 1957, the term ‘Agile’ was originally coined in the early noughties by a group of seventeen software engineers. These had seen the industry convention for development processes that were inflexible – and wasted time and money – and organised a meet to discuss more lightweight methods. Together, they ended up writing the Manifesto for Agile Software Development. Published that year (2001), it outlined the guiding principles behind the Agile Movement. But what does Agile methodologies actually mean for the shape of your development process? 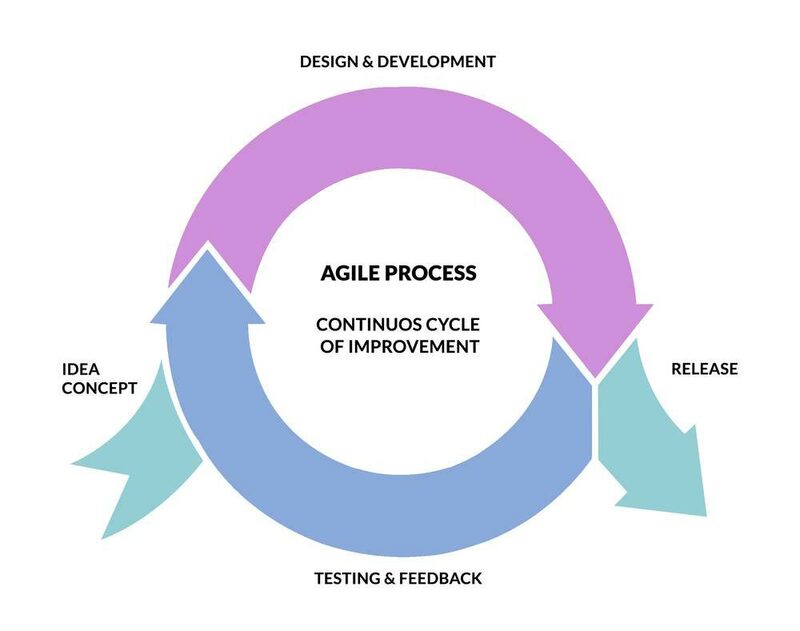 Whilst the previously popular ‘Waterfall’ method follows a progression of steps (which you can see above), Agile is an iterative – rather than linear – development process. It starts with a research and planning period that is shorter and much less prescriptive than Waterfall’s, then rather than moving on to a design phase, the software development begins in ‘sprints’. These tend to be from a week to a month in length, with a cross-functional team working on UX, design and development simultaneously. At the end of each sprint, a meeting is held where the project’s stakeholders can see and assess the working software resulting from that sprint, and help to set the goals of the next iteration. The project develops incrementally, each iteration bringing it closer and closer to the desired final product. It’s also important to note the culture that Agile fosters: by encouraging collaboration and self-assessment, it tends to build teams that are willing to adapt to change, that listen to their stakeholders, clients and users, and that want to constantly improve the quality of their work. Far beyond its original remit of software development, global companies and governments worldwide are already employing Agile to great success, improving productivity and iterating to stay competitive in fluctuating markets. In arenas like these, Agile has demonstrated time and again that it’s a perfect fit for businesses and organisations of all shapes and sizes.